Hit the road tracing the spine of North America! The Rocky Mountains rise thousands of feet out of the prairie, dividing the continent, and providing some of the most dramatic landscapes in the world. The Wyoming / Montana Adventure takes you on a thrilling tour that explores the most geologically diverse landscapes in the range. Hike along the ridgeline of the Teton Mountain Range. Watch hot spring water rush into Yellowstone Lake leaving behind trails of colorful algae. Glide down ziplines under towering limestone cliffs, and come face-to-face with mountain goats grazing on mountainsides of wildflowers. At the end of each action-packed day, dine on fantastic local cuisine and relax your tired muscles in soothing hot springs. Please plan on arriving on day one of your departure in the afternoon. Day one of your itinerary begins with a pick-up at the Jackson Hole Airport according to your arrival time and then a transfer to the Rustic Inn (check-in begins at 4:00 pm onwards). Your first group get-together begins with dinner on Night 1. Your trip ends with a drop-off at your Whitefish hotel (1:30 pm) or the Kalispell airport (2:00 pm). Learn the geological differences between three magnificently dissimilar national parks all within a geographically small area. Hear both sides of the debate concerning the migration patterns of bison from Yellowstone Park. Do you know the differences between a black bear and grizzly bear? Have you heard the splash of a geyser’s eruption as its water crashes to the ground? Did you know that “hole” was the term for “valley” used by fur trappers during the late 1800’s, and Davey Jackson helped settle the Tetons area, hence the name “Jackson Hole.” Investigate for yourself the difference between Yellowstone’s four geothermal features: spouting geysers, steaming hot springs, hissing fumaroles, and bubbling mud pots. Stare 1,000 feet down into the V-shaped gorge of the red, pink, yellow, and orange splashed walls of the Grand Canyon of the Yellowstone River. Search for grizzly bears, bison, elk, pronghorn, and coyotes in the rolling, sagebrush-dotted hills of Hayden Valley. 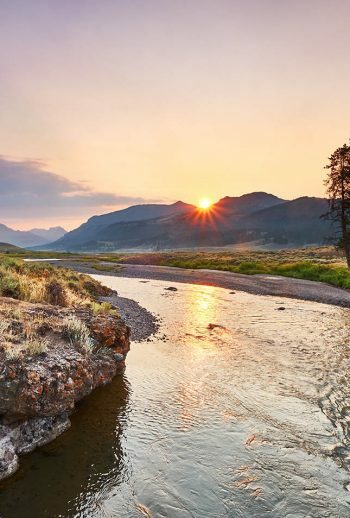 Soak up the beauty of the Cathedral Group: Nez Perce, Middle Teton, Grand Teton, Mount Owen, and Teewinot as you explore the beauty of Grand Teton National Park. When you reach the top of Logan Pass on the infamous Going-to-the-Sun Road, imagine what this high point looks like buried under 80 feet of snow mid-winter…and then think about the amount of snow removal equipment required to plow this spectacular, winding two lane road – amazing! Hunt for the hundreds of different wildflowers that reside in the parks: Bear Grass, Lupine, Fireweed, and Indian Paintbrush are just a few of the colorful beauties you might come across. 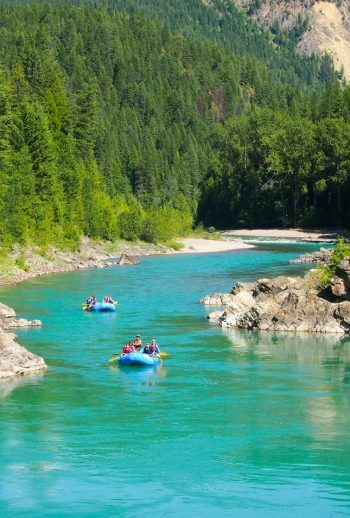 Come discover the fun to be had in the Grand Teton, Yellowstone and Glacier National Parks with the leaders in adventure travel!